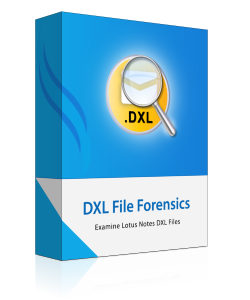 The DXL file forensics tool allows forensic experts to preview Lotus Notes DXL file emails along with attachments. Also the software examines all the emails associated with properties such as Subject, To, From, Cc, received data, sent data, file size in KB. Even this tool plays a vital role when examining any images, documents, PDF etc. As soon as the software is installed, investigators are free to choose the option of quick scanning through which they can get the benefit of loading a file. After that they can simply expand all folders consisting of DXL files. In addition, the user has an advantage of auto search option by using which you can load the DXL files even if you did not know the exact location of your files. After complete scanning of DXL file, the tool will list its emails along with attributes. In case user needs to manage their DXL emails by its all properties such as subject of email, file receive date, file sends date, email address, and the size in KB. The listing will help you to properly arrange the emails according to convenience. To ease the task of the investigator, the DXL file forensics software allows them to switch the screen view mode of the tool. Here they are free to change the vertical view of screen to horizontal view or vice-versa, as per the need. To open & examine Lotus Notes DXL files without installing a corresponding email client, the DXL file forensics tool is the perfect solution because it can be installed on any local machine with or without IBM Notes. Also, it can open and examine the number of DXL files along with attachments. So, this tool is totally independent software which can be used for depth analysis of Lotus Notes DXL emails. Software is developed in such a manner that investigator can face the least complication while using this too to examine Lotus Notes DXL files. Even a novice user can also open and view DXL files. Its interface is resembled to windows explorer style which makes it more user friendly. DEMO version allows you to scan, add and preview the evidence available within DXL files. If you want use advance search, go for PRO version. Upgrade to DXL File Forensic Pro for Advance Search. Can I export any number or size of DXL emails by using this software? Yes,You can convert a number of emails of DXL file without any restriction on the size of emails. Is the software is compatible with Windows 8 machine? Yes,this tool is compatible with windows 8 as well as any Windows OS machine. It was really amazing to know that Lotus notes DXL files could be examine without installing Lotus Notes on my machine.This software felt good to me with its potential and I really appreciate the developer for devoting their potential for creating such a forensic solution. After using DXL file forensics tool, the best thing about this software was that it can provide an auto search and loading files within a second .I must say thanks to Revove Group for a launching best forensic solution for DXL file's data.